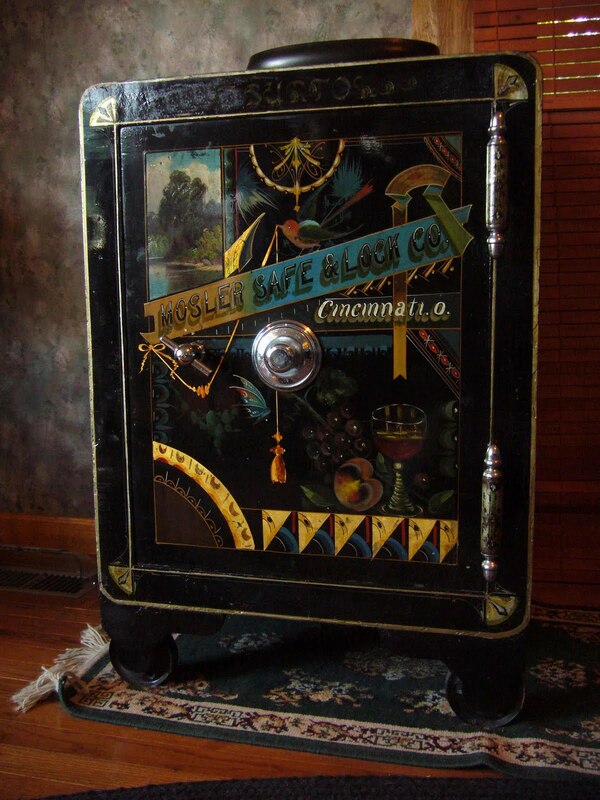 Antique Safes and Vaults: Is anybody out there? 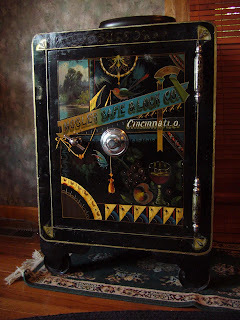 A forum for information about and pictures of the decoration on old safes and vault doors. Waterslide decals, pinstriping, gilding and glazing, and of course the remarkable variety of old lettering styles. This blog is intended to be a forum for everyone who knows or cares about old safes and vaults. Admittedly I am only interested in the surface appearance - the lettering, striping and painting on the doors and sides - but if you know stuff about the locks or construction methods, feel free to comment. From what I can tell, the real center of safe activity was Cincinnati, from about 1850 to 1950. 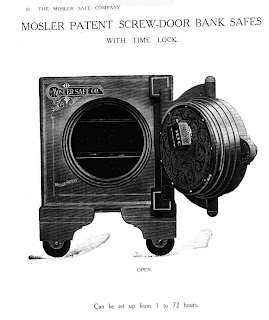 The Victor, Mosler, and Hall companies were in or around Cincinnati, and I suspect there were a number of smaller makers too. Also in town was the Palm Decal Co, the world's largest decalomania company (at least the biggest for non-ceramic uses - ceramic transfers may have been a huge business). which now houses the Cincinnati Historical Society Library. The Library has big collections from Palm Decal and Mosler Safe and smaller ones from Diebold & Victor. The files are mostly about the business, there are surprisingly few photos. Palm has a good set of decals, but they are mostly from the Remington account: guns and typewriter lettering, not the splashy ones I wanted to see. Palm did have some of the early (turn of the century) account books, hand written, and in the 1904 book I found "Aug 16 / CW Coggins & Co Safes & Vaults, Baltimore / 500 pieces Gold with black edge A749" and "Aug 4 / Hall Standard Safe / 7/8 and 12 in A738" and "May 22 / 5500 pieces / Syracuse Safe Co, Syracuse N.Y. / 7 inch A700". I'm sure that more time going through the pages would bring up many more orders sold to safe companies. But there was no cross reference to tell what the designs were - the numbers do not match up with the catalogs. They even had a picture of a Victor safe; very strange - could it have been there because of the hole in the door? Now, what examples do other folk have? Over the years, there have been a lot of strong opinions about biometric safes and they make reliable solutions for your valuables. Thanks a lot mate for sharing about the Antique Safes and Vaults at https://secretstorages.com/ site. Even today people are relying on these. 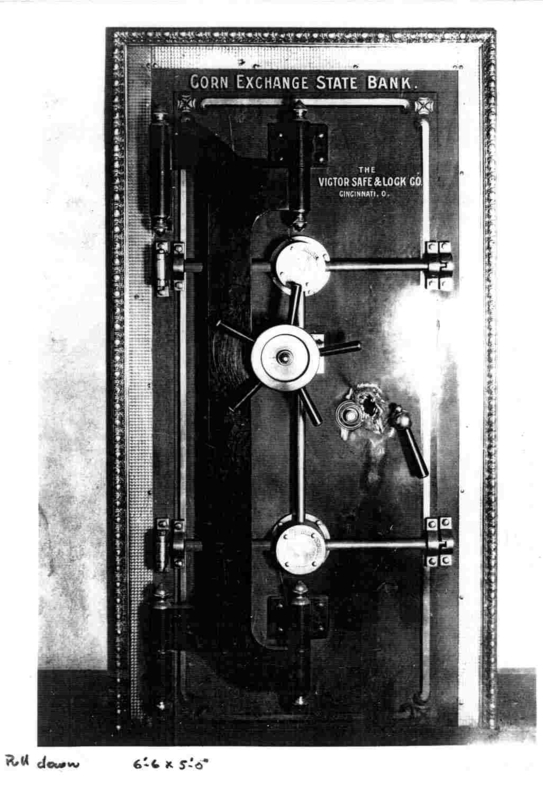 I personally thing that indeed they should keep using these safes. Great tips! First time into your blog, but completely loving it with the wealth of information here and this article is a must read for the home owners.